Ever since Blizzard announced Overwatch at BlizzCon 2014, I think people just naturally assumed it was a free-to-play game. Lots of heroes? Plenty of room for cosmetic microtransactions? It ticked all the boxes you’d expect—Dota 2, League of Legends, Team Fortress 2, and Battleborn all follow a similar model, so surely Overwatch would too. Nope. Today at BlizzCon, fateful words were spoken. “When you buy Overwatch...” The game will retail for $40 when it launches in Spring 2016. Preorders just opened, and if you plunk down your cash early, you’ll get an exclusive “Noir” skin for the hero Widowmaker. 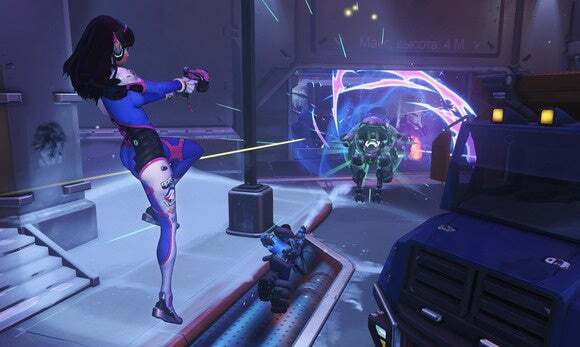 The reason, according to Blizzard’s Jeff Kaplan, is to encourage players to swap between all twenty-one of the game’s heroes, including the three new ones announced today. The implied alternative is Blizzard would sell heroes piecemeal, similar to League of Legends. Technically that’s not the only alternative—you don’t need to sell heroes, as evidenced by Team Fortress 2—but that’s the way Blizzard’s pitching it. It sounds like microtransactions will still be included, but limited to cosmetic items. The $60 “Origins” edition will come with five exclusive character skins—as well as various tie-ins to other Blizzard games like Diablo III, StarCraft II, World of Warcraft and Hearthstone—and I expect more down the line. The price seems a bit steep for a multiplayer-only game—we’ve had a lot of high-profile disappointments in the past year or so, from Titanfall to Evolve. Hopefully Overwatch doesn’t end up among them. Stay tuned for more news from BlizzCon 2015.